Astrid assumed all dragons should be killed – until she met one that changed her mind. A blacksmith in the medieval Northlands, Astrid hides the scars from a long-ago dragon’s bite. But her true powers are a secret even to her… A fast-paced adventure set in an enthralling magical world! Pick up the first book in Resa Nelson’s complete Dragon Cycle. 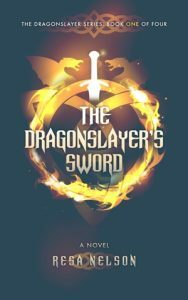 Read “The Dragonslayer’s Sword” as a standalone novel — or continue the journey with the rest of the Dragonslayer series and then the Dragonfly, Dragon Gods, and Dragon Seed series (a total of 16 books, 3 of which are free). This YA Epic Sword & Sorcery Fantasy series is written for adults but appropriate for ages 14 and up. In the medieval Northlands, a dangerous family seeks power. They slaughter all who get in their way. Children’s rhymes hint at what’s to come, but no one recognizes the danger at hand. Astrid doesn’t know she holds the key to this power. She’s just a blacksmith who makes swords for dragonslayers. A dragon once chewed her up and spit her out. She hides the old scars covering her body through shapeshifting. But the time for hiding is over.